Born in Shreveport, Louisiana and grew up in Blanchard, Louisiana. Graduated from Northwood Hight School and was selected for the Six Year Program, an accelerated program for medical students. Graduated from LSU Medical School in 1979. Completed an internship in Internal Medicine. 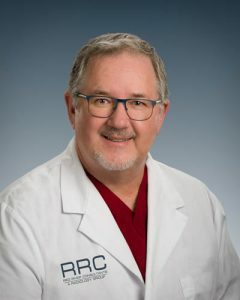 Finished resident in Radiology at LSU Hospital in 1983 followed by a Fellowship in Diagnostic Imaging to include CT Scanning, Nuclear Medicine, and Ultrasound. Joined the Willis Knighton Radiology group in 1983. Developed the Nuclear Medicine Department particularly the cardiac evaluation modalities. Currently the Clinical Director of Ultrasound and Nuclear Medicine and the Chief Medical Officer of Red River Consultants. Interests also include PET/CT scanning and Mammography. Also a published author with 7 books to date on depression and supernatural thrillers. Married to Sherry Kidd Hennigan and have raised two grown adult children.